We�re past the halfway mark in conference play, so not only are teams in the middle of pack trying to sort themselves out, but the teams at the top are trying to wrap up their league titles. Kansas figured to easily take the Big 12 after flirting with an undefeated record, but it will travel to Austin this week to face one of its main challengers. Michigan State thought it might be battling Indiana for the Big Ten, but a new contender has emerged. Plus, those �other� two elite Big Ten teams have a rematch and two surprising Big East teams duke it out. And, of course, in addition to our top games this week, we�ve also got our always interesting bubble games to add to the fun. Looking to win the Big 12 regular season title for the fourth straight season, the Kansas Jayhawks don�t have to deal with the media circus of staying undefeated anymore. Bill Self handed all the attention to John Calipari, who will, for the rest of the season, be bombarded with questions about the 1991 UNLV team, how he keeps his team level headed, and if he would �like� to lose a game before the NCAA tournament (my personal favorite). But as far as the basketball goes, I�m not sure how Kansas failed to make a three-pointer against Baylor on Saturday and still managed to score 100 points. I am trying to figure this one out but the only explanation I can come up with is this: Kansas is an incredibly good team. Texas isn�t so bad itself, though, as you probably know from seeing the Longhorns beat Tennessee and UCLA this November. Since then, it has been rocky, and an extremely close call in overtime against Iowa State this weekend almost knocked them out of the conversation as a Big 12 title contender. I don�t see Kansas losing more than one Big 12 game the rest of the way, and I�m just not sure Texas can keep up. But when you have a player as talented as D.J. Augustin on your team along with what the Longhorns have surrounded him with, you can compete against any team in the nation. 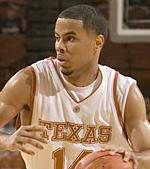 Kansas� frontline has been dominant lately and will do the same to Texas, which is its main weakness. The Longhorns� firepower will make for a great Big Monday match-up but Kansas will prevail with its inside prowess. When Purdue nearly went into East Lansing and beat Michigan State Jan. 8, the effort was encouraging. We said they just �couldn�t pull off the upset,� and that the Boilermakers were making improvements as a young team. Well, throw that youth argument out the window, forget about progress, and realize that Purdue has become the leader in the Big Ten and that Michigan State will actually have to �pull the upset� in Mackey Arena Tuesday night. For as much as we talk about Cameron Indoor Stadium, Allen Fieldhouse, and the Kohl Center, Purdue has as much of a home court advantage as anyone. Their student section is outstanding and the place is wild hours before tip-off. That�s part of the reason why the Spartans are the underdog in this game. Another reason is the Boilermakers have looked unbeatable lately. Nine straight wins have Purdue at 10-1 in the conference, and Michigan State is 8-2 has two perplexing road losses to Iowa and Penn State. Some games the Spartans look like a Final Four caliber team, and in others, they look like your everyday middle-of-the-pack Big Ten team. The latter better not show up on Tuesday or it could get ugly in West Lafayette. I�ve mentioned to some people that I wish I were a Purdue fan right now. No, that doesn�t mean I�m giving up on my Missouri Tigers (no amount of bar fights, arrests, and losses could ever take away my allegiances to Mizzou! ), but the Boilermakers look like a team that, if the four freshmen stick around and don�t leave for the NBA, could be National Championship good in a few seasons. That learning curve has been eliminated and Purdue is having this success early. It is obvious the Boilermakers have unbelievable potential, and this season has been wildly successful so far, but a win over Michigan State would validate everything for me. I can�t say that I�ve been that impressed by the inconsistent performance of the Spartans and I think Purdue can take that extra step and grab a firm hold of the Big Ten by winning Tuesday night. We thought Notre Dame and Connecticut might be good, but it�s been a crazy Big East season and these two teams have themselves pushing toward the top of the conference. The battle between Luke Harangody and Hasheem Thabeet should be a fun one on Wednesday, but this game�s importance lies in the fact that with a Huskies win, Notre Dame and UConn would be tied in second place with Louisville, creating an even bigger logjam throughout the Big East. As well as Notre Dame has ben playing well, I have to go with the Huskies in this one. It�s like they can�t lose. And while the Irish have a little streak of their own going, look at who Connecticut has beaten- and not just beaten, but beaten consecutively. Marquette, Cincy, Indiana, Louisville, Pitt, Syracuse, and Georgia Tech. That�s insane- the Huskies didn�t lose a single one of those games. This team is for real, people. Didn�t these two just play each other? Yes, in fact they did, just two weeks ago. Wisconsin won fairly handily and established itself as a Big Ten contender. Now, at Assembly Hall, Indiana will be looking for revenge. I don�t think the Hoosiers will get it. I�ve seen nothing from this team to suggest that it may be Final Four caliber, Big Ten Champion caliber, or even anything more than just a regular NCAA tournament team. Eric Gordon and D.J. White have become household names, but Indiana has played an extremely soft schedule and has struggled in many games against inferior opponents. The Badgers have to travel to Bloomington this time but I see the same result as last time- a Wisconsin win. A few months ago I would have made a joke about how bad Maryland was and predicted Duke to win by 50. Well now, it�s a different story. The Terps are actually a good team. Offensively, things are beginning to click, and players like James Gist and Bambale Osby are beginning to shine. Don�t forget Greivis Vazquez, who has always had promise but is just now beginning to get noticed. Duke is playing some of the best basketball of any team in the country right now, coming off a win last week in Chapel Hill. Boston College couldn�t catch the Blue Devils in a hangover on Saturday and Duke looks like it is in great position to win the ACC. In College Park, we saw Maryland battle Duke basically to the wire. In Cameron Indoor Stadium, that won�t happen. But no 50 point blowout will occur. The forgotten Arkansas Razorbacks are streaking and in position to win the SEC West. Tennessee, on the other hand, is more than just in position to win the East- it should win that division barring a collapse. Though Arkansas has been up and down this season, the �good� Razorbacks have been showing up lately, having won four straight games against LSU, Mississippi State, Florida, and Mississippi. When they make the trip to Knoxville on Wednesday, we should be in for an intense and fast-paced game, but even though Arkansas is improving, the Volunteers can annihilate you if you aren�t careful. I don�t expect annihilation, because I think John Pelphrey has his team playing solid basketball. But Bruce Pearl�s team should take care of business. These two teams are separated by just a game in the standings, but the Pirates do not have the luxury of having the type of resume the Golden Eagles do, and therefore find themselves on the bubble. Tuesday�s game will be a high-octane battle between perimeter-oriented teams needing a victory, and I think Marquette will be the team that comes away satisfied, especially after seeing Seton Hall�s current three game losing streak. Could this finally be the game Memphis loses? Any time the Tigers face even an average Conference USA team, the upset watch will be on. But forget about that. On to 34-0! The one team that has been forgotten in the Atlantic 10�s successful run is Charlotte, which actually sits in fourth place in the conference, two games behind Wednesday�s opponent, Xavier. But as the favorite to win the league title, the Musketeers have won six straight and will continue to roll the rest of the way. Even though SIU Arena�s intimidation factor is lowered severely due to Southern Illinois� mediocre season, this still may be Drake�s toughest Valley test remaining. I expect the Bulldogs to pass it, just like they have all season. Believe it or not, UCLA�s loss Saturday vaults Stanford into a tie atop the Pac-10. No road game is an easy one in this conference, but the Cardinal will complete the season sweep and continue on in their quest for a conference title. Big, big game here, on both sides. Sometimes, you begin to think Arizona just may be a team deserving of its massive hype, but then it goes ahead and loses at home in ugly fashion to its in-state rival like it did on Sunday. California had some momentum, winning three straight games at one point, before losing to Oregon at home on Saturday, which may end up being a crushing defeat for the Golden Bears. This game will have a sense of urgency and I see the Wildcats grabbing this critical win- after all, they did beat California in Berkeley last month. Once again, Clemson was so close to beating North Carolina only to eventually blow their shot at glory. But it gets a chance to take its anger out against Georgia Tech Thursday, and since the Tigers have lost just one home game this season, I like their chances.